Easy to assemble, can be moved around where I need it to be, very sturdy and solid addition for my garage! no disappointments with this purchase! 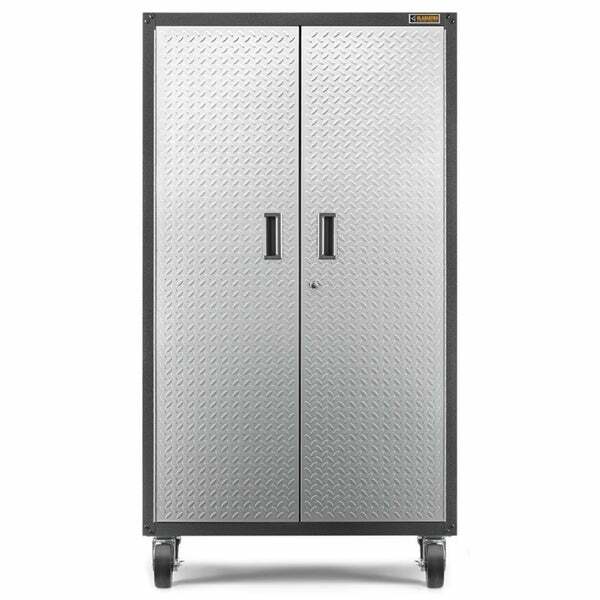 At 5 ft. tall, 3 ft. wide and 1-1/2 ft. deep, this Gladiator Freestanding Steel Cabinet accommodates anything from camping gear to sports equipment. Safely house all your equipment with built-in, locking doors. Gladiator's EZ design makes assembly fast and seamless, and to customize your space, you can also raise the cabinet off the floor with the Wall Bracket Kit and Gladiator Wall System (sold separately). Dimensions 19.0 In. X 36.0 In. X 60.0 In. I love this Cabinet! I lit is the perfect size for my needs. Rugged and very durable. The casters make it easy to move around. I think you will be very pleased if you purchase this cabinet. I highly recommend. "Could this serve as a closet to store clothing on hangers?" "Do the casters come with this product?" Yes, they do. I hope it helps.